“Shake The Lake” is such an audacious work of comics with such an uninhibited and unflinching depiction of frenzied youth–it is truly a hell of a lot of fun and mesmerizing. These are a bunch of out-of-control kids, the sort you’ve seen in numerous teenploitation horror and summer movies. They all, at first, seem to lack any redeeming character but you get hooked into their little nefarious activities and you just can’t look away. 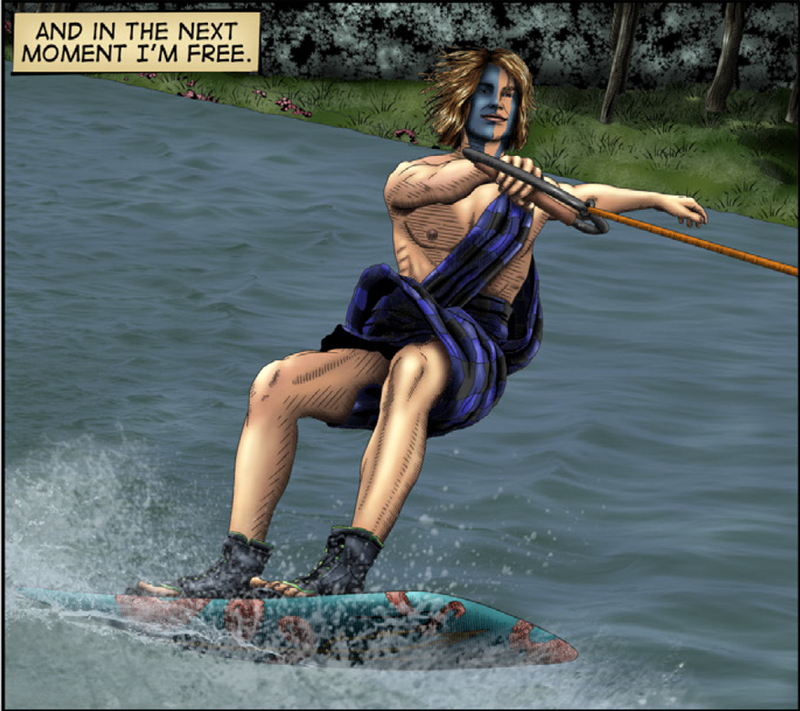 But who ever heard of a graphic novel devoted to wakeboarding (think skateboarding on water)? Am I supposed to know about wakeboarding? That level of specificity is part of the subversive fun. You need to check out this wonderfully oddball badass series right here. Cal in his element. It’s an endless summer, dude! Of course, wakeboarding is important–especially for those in the wakeboarding scene, which all of these kids are totally into. And some people are fully aware of wakeboarding but to the other extreme like Zeke and Dalton, these two highly obnoxious park rangers hot on the trail of all fun-loving youth. Leave it to them and they will spoil everyone’s fun, particularly anything remotely hedonistic. Hey, it’s the summer and a bunch of young rebels are determined to make their mark. Cal is the lead instigator. He’s already 23, but it is still a life of beautiful teen summers for him and his fellow dreamers. If they could just stir things up at the ole marina, put on a wakeboarding festival to be remembered in their collective old age, then all this arrested development will have been worth it! Brothers Zach and Machi Block’s script rings true. The Block brothers invest in their ragtag characters a level of integrity that lures you into wanting to know more about this subculture. The artwork by brother and sister team Diego and Andrea Lopez Mata are true to the Block vision bringing out all the crude and raw beauty of this motley crew of wakeboarding fanatics. If you go in not knowing a thing about wakeboarding, after reading this work, you’ll be glad to leave it to the experts and just enjoy the ride. Visit the “Shake The Lake” site right here.